Add this vanity to your bathroom for more modern style in your home. The white marble counter and brown solid wood base make a beautiful look in your bathroom. The simple look of the double-door cabinet and drawers is useful and classic. Redo the style of your bathroom with this classic from Wyndham Collection. Designed with natural elements in mind the Beachwood collection brings nature into your home. With 3 organic wood grain colors to choose from this vanity brings warmth to modern architecture. The Beachwood Collection offers an abundance of storage space within its unique and seldom offered 42" design. Adding new function to small spaces, the Trough Collection is a uniquely superb design that balances form and function with ease. This minimalistic wall mounted vanity conceals its full function, with two fully functioning drawers hidden behind the deep textured woodgrain fagade, storage is never a problem. Styled in Europe and manufactured in Canada each cabinet is constructed using European high-grade materials. With a unique 15" depth this vanity is a perfect solution if space is in short supply. This vanity is a great way to add traditional style to your bathroom. The single-door cabinet and drawer are great for putting away bathroom items. Put a nice twist on your bathroom project with this classic piece from Wyndham Collection. 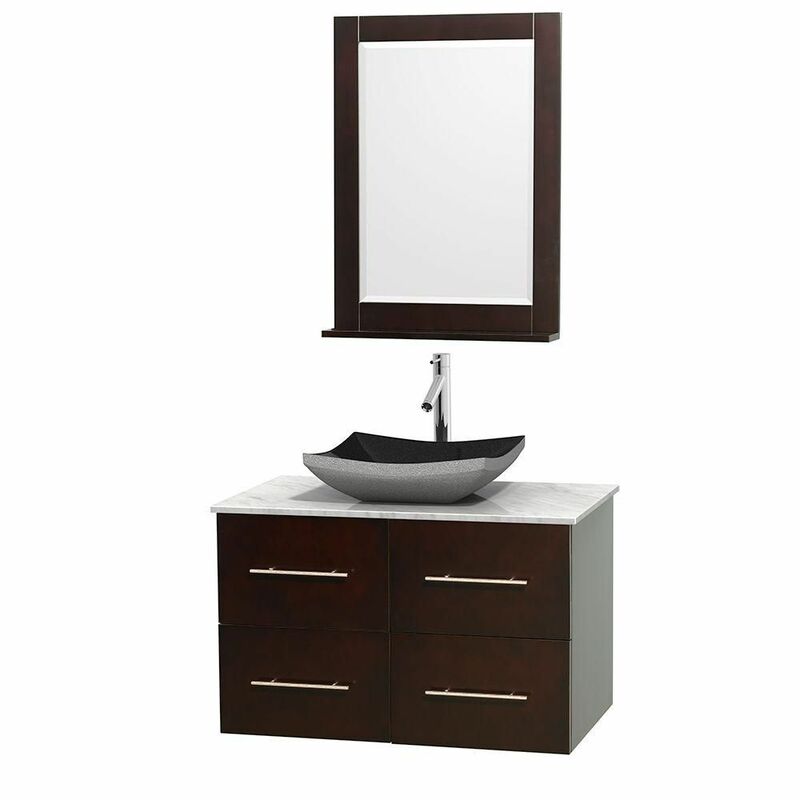 Centra 36-inch W 2-Drawer 2-Door Wall Mounted Vanity in Brown With Marble Top in White With Mirror Add this vanity to your bathroom for more modern style in your home. The white marble counter and brown solid wood base make a beautiful look in your bathroom. The simple look of the double-door cabinet and drawers is useful and classic. Redo the style of your bathroom with this classic from Wyndham Collection.